It's interesting that director David Ayer would reach out to fans via Twitter to find out how closely he should stick to the Suicide Squad comic books. Quite a few fans have loudly expressed their dislike of Will Smith as Deadshot, taking Warner Bros. to task for this casting choice, mainly because he's not the same race as depicted in the comics. That aspect of the movie doesn't seem to concern Ayer though. He is more interested in how much he should stay within the walls of the DC Comics canon that already exist. In his latest series of Tweets, the director shows off the comics that are serving as inspiration, while also questioning how far he should go with Margot Robbie's Harley Quinn. Recent plot rumors regarding Suicide Squad indicate that it will play an important role in setting up the DC Comics movie universe. And it's expected to tie into Batman v Superman: Dawn of Justice, with a cameo from Ben Affleck as Batman and a supporting role from Jesse Eisenberg as Lex Luthor. 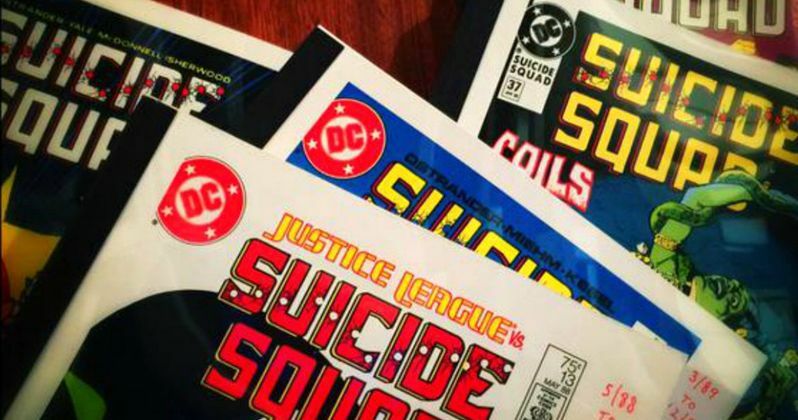 As you can see in the tweets, David Ayer is pouring over the Suicide Squad comics from the 80s, citing issues number #13 and #37 as important pieces of the puzzle. Suicide Squad has a vast and rich history when it comes to the DC comics. They began in the late 50s as a group of World War II soldiers, also known as Task Force X. They have gone through many incarnations throughout the years, and now exists as a team of super villains who go on secret missions to clear their name. As we already know the character line-up, the later is the incarnation David Ayer is definitely going with. And as evident in one of his other, rare picture-less tweets, he wonders aloud just how much Harley Quinn should be defined by her love for the Joker. It's likely that this one character, a fan favorite, will play a key role in future DC movies. At least the director is putting some thought into how she should be handled as he continues to define and improve the script heading into production this spring. Now we just need to know who will play Rick Flagg, and we're all set to go!